Varian Medical Systems is a leading manufacturer of medical devices and software for radiation oncology treatments. With a global presence of more than 6,500 employees distributed between 70 offices around the globe, Varian has implemented sales and service management solutions using Salesforce, ServiceMax and SAP. These packaged applications often drive business-critical processes, but when manual transaction validations are required from non-technical resources, testing and code quality can suffer. For Varian, the world’s largest cancer/oncology medical device and software provider—it’s imperative that they’re able to quickly service the products that people’s lives depend on every day. To keep up with their demand for continuous quality in their highly-regulated environments, Varian partnered with Tricentis and Infostretch. Tricentis and Infostretch partner together to help teams accelerate digital transformations through continuous testing, agile, and DevOps initiatives. 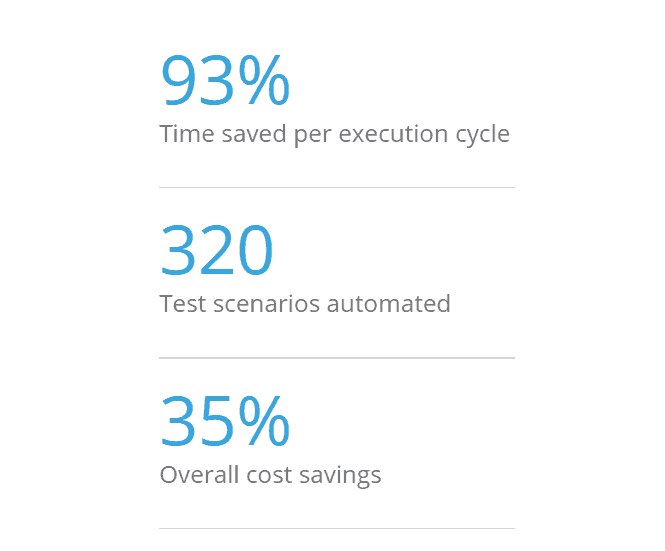 Together, we helped Varian automate key processes, leverage continuous integration, streamline test data creation and management, and reduce their testing costs by 35%. Given the complexity of Varian’s SDLC, data dependencies, and packaged application integrations Tricentis and Infostretch built a parallel agile lifecycle alongside Varian’s existing workflow. This ensured that existing critical lines of business were not disrupted during Varian’s testing transformation, and enabled Tricentis and Infostretch to identify key areas of focus and processes throughout the SDLC that could be modernized with an innovative approach to test automation. In just 6 months, Tricentis and Infostretch enabled Varian to more easily determine the suite of tests that cover their top business risks and reduce the maintenance of that suite to an absolute minimum. By fully automating packaged application testing without the need for technical expertise, global enterprises like Varian break down communication barriers, receive faster feedback, and validate critical business processes faster.